In a Nutshell: Many Americans might take educational opportunities for granted, but for a large portion of the US population, the odds of earning a degree can seem monumental. By recruiting diverse, talented graduates from the nation’s top universities and placing them as teachers where they’re needed most, Teach for America is inspiring and educating underserved children in low-income communities. The bright, young educators that are part of Teach for America make two-year commitments to work in classrooms and help students in need unlock their potential through quality education. When Elisa Villanueva, the CEO of Teach for America, visited eastern Kentucky’s Appalachian region, she found a welcoming community — one where individuals held a strong sense of family values. Located in the heart of coal country, the region has been hit hard by unemployment, as environmental concerns have led to declining demand for the natural resource. The state has the fifth highest poverty rate in the country. Teach for America (TFA) is an initiative that brings quality education to underserved communities. The nonprofit organization regularly recruits and trains a dynamic group of college graduates to become corps members so they can teach in low-income and rural areas across the United States. The Appalachian region is one of 53 regions where TFA works, and Elisa wanted to find out what kind of impact the organization was having in the area. 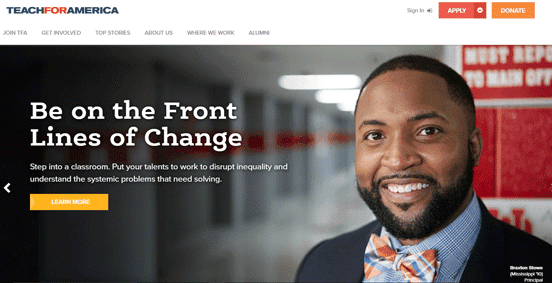 Teach for America aims to bring transformation to low-income communities through education. While rural areas are a major focus, TFA has other strategic initiatives that aim for equality in education that serve other communities, such as minorities, members of the LGBTQ community, and military veterans. TFA is paying special attention to the unique needs and values of these communities to better accommodate diversity within each group. Corps members commit to a minimum of two years in urban and rural schools, many moving on to become leaders in the organization so that they can continue to expand the program’s reach. Teach for America has more than 46,000 alumni, and 85% of them work full time in education or with low-income communities across the United States. It’s an important cause as sometimes it only takes one teacher to recognize and unleash untapped potential in a child and change their lives through education. Through educational work with minority communities, military veterans, and the LGBTQ community, TFA allows members to connect on a diverse set of perspectives. Educational inequality affects individuals from these groups. For example, 8 in 10 LGBTQ students surveyed reported harassment at school, while the dropout rate in this group is three times the national average. TFA looks to solve these issues by using community feedback to understand and implement strategies that get results. By spending time within these different communities, TFA corps members gain a deeper understanding of the unique challenges people face. Educators get the resources necessary to support students in marginalized communities. Resources include materials on topics like immigration laws and services that affect specific populations, migrant guides, and welfare information. By understanding the very real challenges that people are dealing with, corps teachers are able to create a safer space for all students. Becoming a corps member with TFA is a rewarding opportunity, and one that can lead to a lifelong mission toward promoting change in underserved communities across the nation. 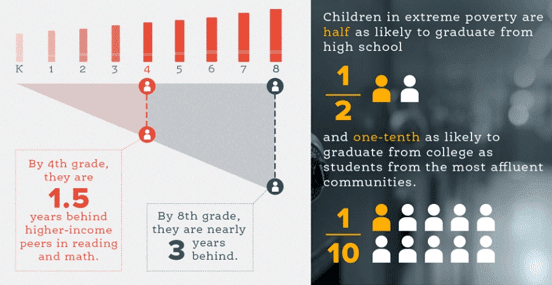 According to TFA statistics, children in extreme poverty are about half as likely to graduate from high school as their higher income peers, and only one-tenth as likely to go to college as those from more affluent communities. By fourth grade, they’re 1.5 years behind in reading and math, and by eighth grade, they’re nearly three years behind on average. These jarring numbers are a direct reflection of the lack of resources available to students in low-income communities. Financial background plays a huge role in success by students, which demonstrates the need for TFA. TFA recruits, trains, and places college graduates with a variety of interests and backgrounds, all of whom have excelled in school and show leadership strengths. Many of the recruits share racial and/or economic backgrounds with the students being served as well, so they can better relate to those they are helping. Once recruited, corps members spend approximately 30 hours working independently and observing experienced teachers as part of the training process. Once they’ve completed this work, they’re placed into an intense five-week training institute, followed by an orientation within the communities and schools where they’ll be teaching. Nearly two-thirds of TFA alumni work full time in education with almost half working as classroom teachers. Once TFA corps members have gone through the training process and they’re ready to teach, they commit to a two-year program within the classroom — one that involves teacher support and development for continued leadership. For some corps members, this initial commitment leads to a lifelong journey of service and education. Those who leave the corps after two years still gain perspective on widespread challenges across the nation. By building relationships with students and improving their chances of graduating, these young educators are paying it forward and promoting long-term change by inspiring a generation of students to improve their lives and the communities around them. This positive momentum creates a cycle that could lead to a new generation of TFA teachers looking to give back to those junior to them. Since 1989, Teach for America has been successfully changing the course of how students in underserved communities learn. Children don’t ask to be born into circumstances that leave them at a disadvantage, and TFA is doing its part to make educational inequality a thing of the past. Intellectual and creative abilities are inherent in every child, and many just need to be in a supportive environment where they can cultivate them. Having access to quality education should be a basic human right, not a privilege. TFA is taking the necessary steps toward eradicating inequality by recognizing this and taking action. Now, with more than 53,000 corps members and counting, TFA continues to grow and expand, creating opportunities for students to grow, thrive, and become leaders.